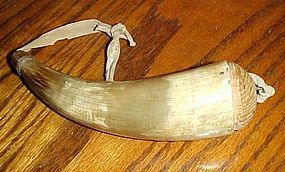 Very old powder horn made of a horn. Wood top plug with leather strap. Measures about 7 1/2" long. Great condition. 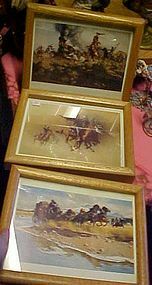 Framed prints by well know western artist Frank McCarthy. In my opinion his artistry was just as wonderful as the Remington western prints. These are framed in nice 9 1/4" x 11 1/4" oak frames, and ready to hang and enjoy. Excellent condition. Frank McCarthy passed away in 2002 but left images of his wonderful western art for future generations to enjoy. Selling as a set. Hard to see, but one has indians chasing a train, One has a stagecoah scene, abd the others have bandits on horseback. 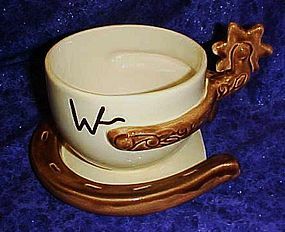 Perfect cup and saucer for that Texas cowboy who like a big cup of coffee!! Made of hand painted glazed ceramic. Cup has a horseshoe shape and the cup has a brands and a spur on it, which doubles as the handle. Cup is 3 1/2" tall (plus spur). and has a diameter of 5". Saucer measures 6 1/2" x 7". pristine condition as new. made by Storyteller Arts. I have 2 sets available. Price is per set. save money with combined shipping. You pay only actual shipping. Large glazed stoneware shakers with nice size handles measures 3 3/4" tall. 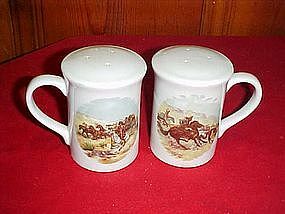 Both have one of the Remington old west scenes. One of a cowboy on a horse and the other of Indians and horses. Western scene is on both sides, Original rubber stoppers. Excellent condition. 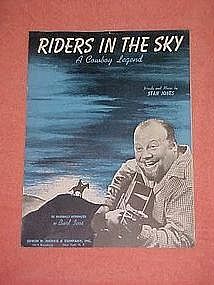 Riders in the Sky, The cowboy legend. words and music by Stan Jones. Originally intriduced by Burl Ives. (cover photo). Very good condition. 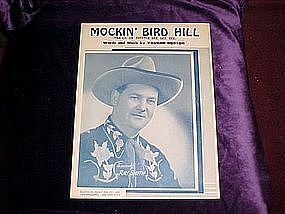 Country version of sheet music with a large publicity photo of Ray Smith 1949, Sincerely, Ray Smith on photo. Selection of this music is Mockin' Bird Hill by Vaughn Horton. Extremely nice condition! !